Dogs have a biological need for a diet rich in meat. Acana Regionals Wild Prairie Dog is dog food with chicken meat, pears and pumpkin. The food is low in carbohydrates and does not contain grains, corn or gluten. Dogs have evolved as carnivores, with a biological need for a diet that contains a variety of fresh meat and fish combined with a small amount of vegetables, fruits and grasses. The Acana Regionals range is formulated with a variety of ingredients, such as lamb, free-range chicken, free-range eggs and fish from Canada's northern lakes. Wild Prairie Dog contains fresh chicken and chicken meal, cranberry and spinach. These ingredients are delivered fresh to Acana's kitchen every day and processed on the spot. Acana produces natural pet food with local ingredients, taking into account the evolution of cats. Their original diets were protein-rich and full of fresh meats. The ingredients are bought locally (Alberta, Canada). Acana Biologically Appropriate is formulated with fresh meat, fresh fish, vegetables, fruits and herbs suited to the needs of your cat. Biologically Appropriate food largely consists of fresh ingredients and matches the digestive structure of the animal. The products do not contain any artificial scents, colours, flavours or other additives and are free of GMOs (Genetically Modified Organisms) and antibiotics. 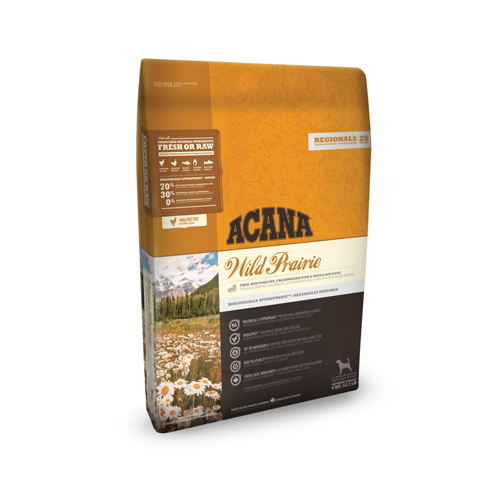 Have you used Acana Wild Prairie Dog Regionals before? Let us know what you think about this product.